If you’ve been on my site before you know I’m all about chocolate ( hello Chocolate Snickerdoodles, Chocolate Peanut Butter Bars, and Chocolate Greek Yogurt Parfaits)! Today though…it’s all about these super soft and incredibly moist Carrot Cake Gooey Butter Cookies! Trust me when I say these don’t disappoint even the biggest chocolate addicts! Hallelujah for spring break this week! I’m beyond excited to put my role as a teacher on the back burner for the week and get caught up! I already know my list is much longer than I would ever have time to accomplish in a year let alone this week. Here’s a quote that pretty much sums it up, “We overestimate what we can accomplish in a day, and underestimate what we can accomplish in a year”. That’s me for sure! 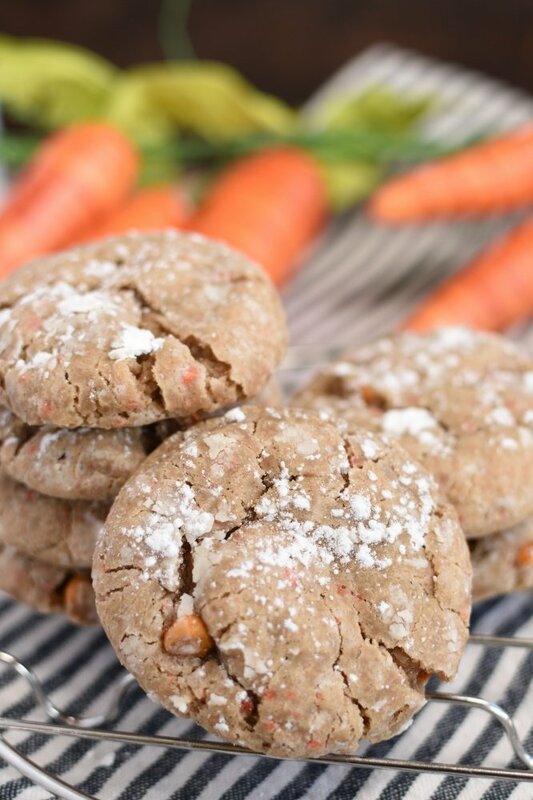 Anyway, sharing the recipe for these incredible Carrot Cake Gooey Butter Cookies was at the top of my list this week and so that’s happening today…nevermind the piles of laundry and filthy garage! Your welcome! 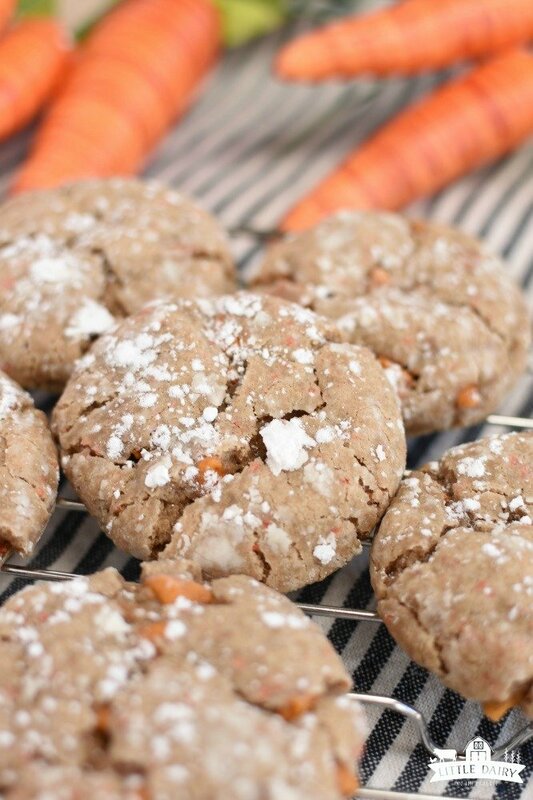 Make Carrot Cake Gooey Butter Cookies for Easter! I realize Easter is all about carrot cake! Everyone goes crazy for it! I’m not sure if it’s the cake or the cream cheese frosting everyone goes is all twitterpated over. Well, I’m really not on board with the whole carrot cake craze! 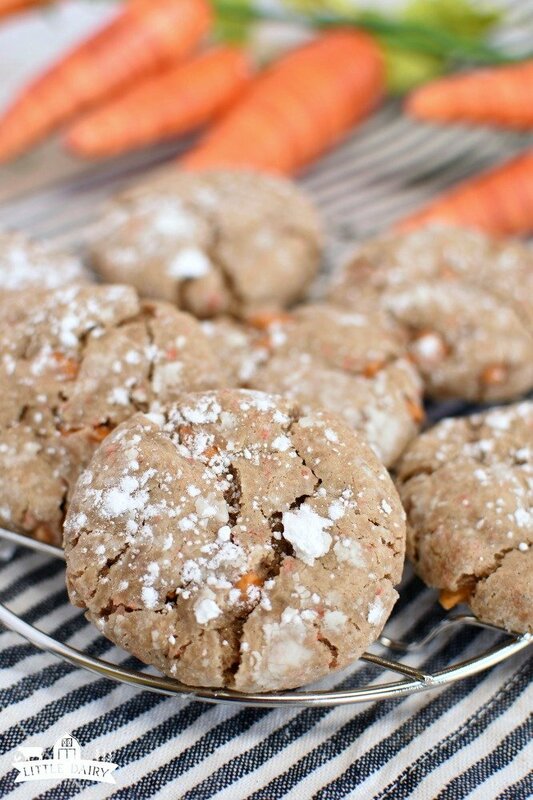 But, Carrot Cake Gooey Butter Cookies I can totally get behind! You know since they are called “gooey” cookies you would imagine them to be soft and gooey inside. They deliver all the gooey you can handle! 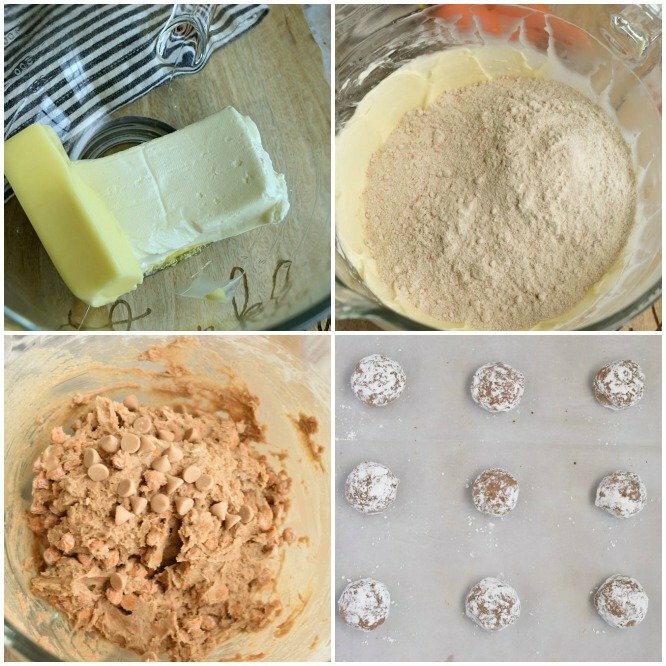 If you are more of a cream cheese frosting lover Carrot Cake Gooey Butter Cookies are the answer for you! They have cream cheese mixed right in the dough giving them that amazing tangy, sweet flavor that’s so irresistible! Can we talk about being busy for one more minute please? I know everyone is busy. It is crazy no matter what stage of life you are in! Sometimes though, don’t you feel like if one more thing gets piled on your plate you are going to drop the whole thing. It kind of feels like I have about 15 balls in the air at once and I’m supposed to juggle them all, all day long, everyday. And the scary part is that you know pretty soon someone is going to throw that 16th ball in and expect you to play with it too! Well, if you feel that way and somehow you’ve been elected to host Easter dinner, or you elected yourself to make Easter dinner, or if you just need to slap a meal on the table check out these favorites. They are fancy enough for an Easter feast and simple enough you might find yourself coming back to them over and over again on busy weeknights! Check out this list of easy recipes! Okay, are you feeling a little better? I totally understand how overwhelming the to do list can be! 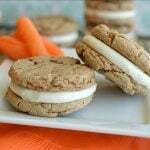 Seriously, cut the time consuming carrot cake out and add Carrot Cake Gooey Butter Cookies instead! No one will miss the carrot cake, you might even have time for a bubble bath, And I wouldn’t be surprised if these cookies became your new Easter tradition. They are that good! Now grab a cookie and move taking care of yourself up on the to do list! Save this recipe to Pinterest for later or print it now! 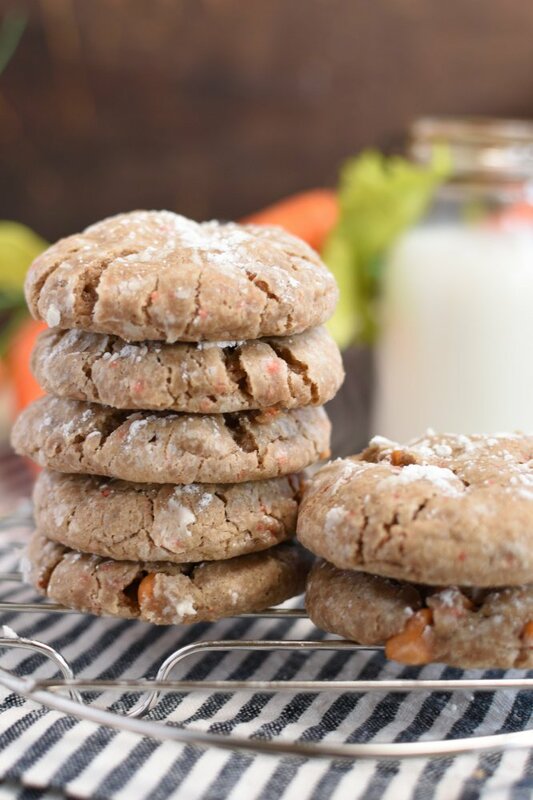 Carrot Cake Gooey Butter Cookies - you guys these cookies only have 6 simple ingredients which makes them perfect for those of us that want carrot cake and cream cheese frosting without all the fuss! 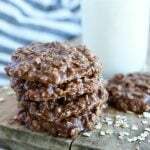 Don’t let the simplicity of the recipe fool you...they are out of this world! I love carrot cake, but sometimes it takes a lot of time to make. 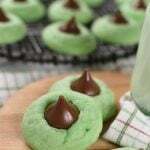 I LOVE the idea of cookies! Can’t wait to try them! I can’t wait for you to try them! If you love carrot cake I’m pretty sure you are going to be pleased with these! I love that you put my favorite cake in a cookie form!! These need to happen ASAP! Yay for your favorite in a new form! I have a feeling you are going to fall in love with them! I am saving this for later. I love everything about these cookies. Doubling the batch and saving this recipe for later. More cookies is always a good thing! I love the texture of these gooey butter cookies!!! 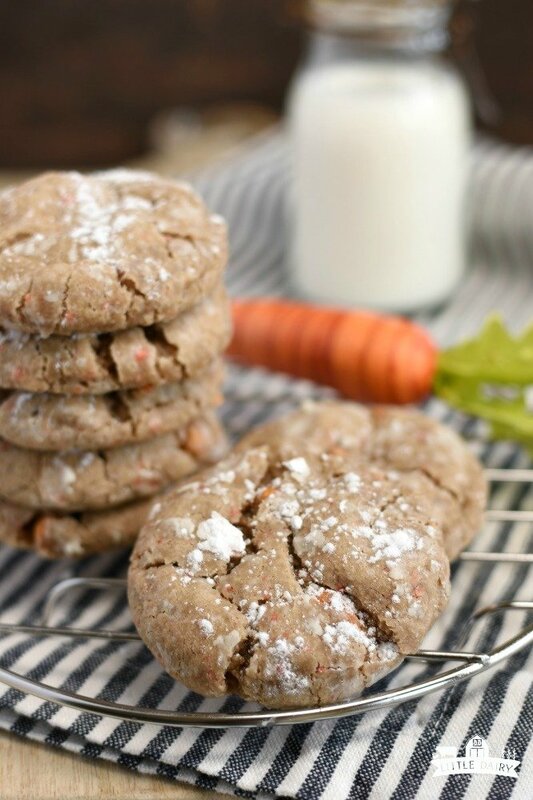 They are so soft and moist…exactly as you would expect a carrot cake cookie to be! Thanks! They have that incredible carrot cake/cream cheese frosting taste, yet they are so much easier to make than a cake! Gotta love that! I’d love to grab some right now! These look delicious!